Communication is, by default, a multisensory phenomenon. 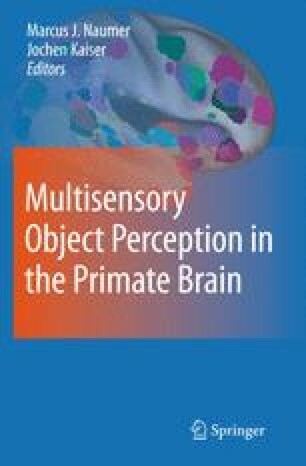 In support of this contention, I review evidence that beyond the familiar ideas about audiovisual speech in humans, there is also automatic integration of faces and voices during vocal perception by monkeys and apes. At the neural level, this integration is mediated, in part, by interactions between 'unimodal' sensory areas and association areas in the temporal lobe. How these neural interactions develop may be driven by species-typical social experiences. The overwhelming evidence from the studies reviewed here, and numerous other studies from different domains of neuroscience, all converge on the idea that, like the behavior of communication itself, the neocortex is fundamentally multisensory. It is not confined to a few ‘sensu comune’ in the association cortices. This does not mean, however, that the neocortex is uniformly multisensory, but rather that cortical areas maybe weighted differently by ‘extra’-modal inputs depending on the task at hand and its context. The author gratefully acknowledges the scientific contributions and numerous discussions with the following people: Chand Chandrasekaran, Kari Hoffman, David Lewkowicz, Joost Maier, and Hjalmar Turesson. This work was supported by NIH R01NS054898 and NSF BCS-0547760 CAREER Award.